This is a lesson on where less is far more, casting, writing and acting perfect. Brilliantly directed by Fisher Stevens, (Just a Kiss) and a witty and gritty pen from Noah Haidle, (Gym Short). Despite their inexperience at the sharp end of the business they have produced a cracking film that warms the heart of true friendship. 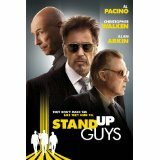 Val, (Al Pacino, Scarface) has spent 28 years behind bars for a heist that went wrong and now someone wants him dead.